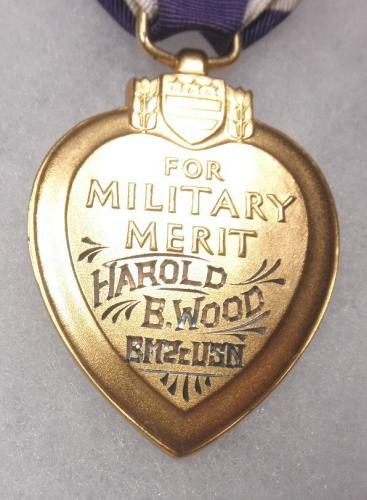 World War I Collector - WW1/WW2 Memorabilia Collection - Wood, Harold B.
Harold Baker Wood was born April 19, 1919 in Fargo, North Dakota. 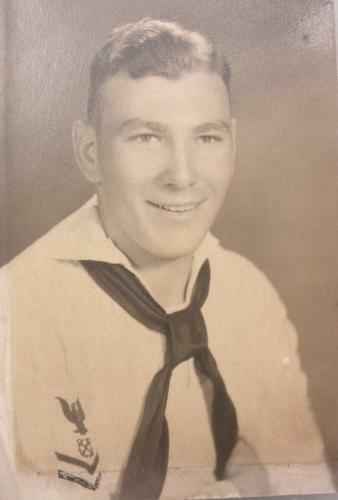 He enlisted in the Navy September 9, 1938. He went to training September 12, 1938 in San Diego. 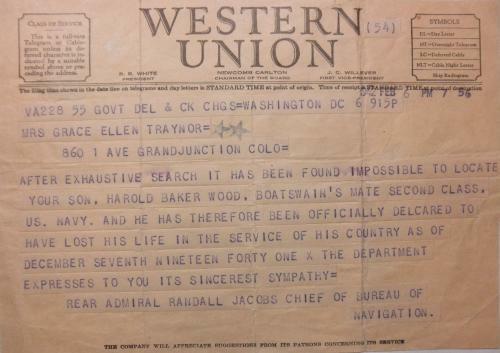 Wood was transferred to the Arizona December 31, 1938 and reprted on board January 2, 1939. 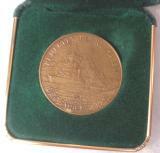 He is shown as a Seaman 1c on that date. On March 27, he had completed his practical factors for advancement to Coxswain. On June 16, 1940, he was transferred to the USS Colorado BB-45 for temporary duty in AA Battery Gunnery School. 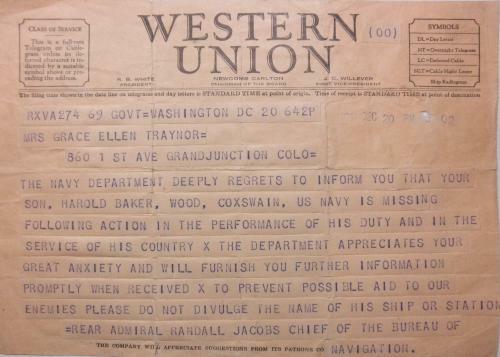 He transferred back to the Arizona on July 29, 1940, and was promoted to the rate of Coxswain. His rate was changed to BM2c on October 28, 1941 as shown on the USS Arizona muster rolls for November 30, 1941. An entry in his record as of January 5, 1942 states "Listed as 'missing' since action against enemy at Pearl Harbor, T.H. 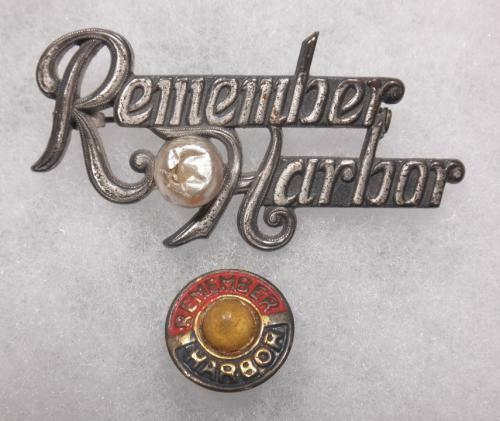 on December 7, 1941 man has not reported to any naval activity and body has not been recovered or identified. Next of kin notified." 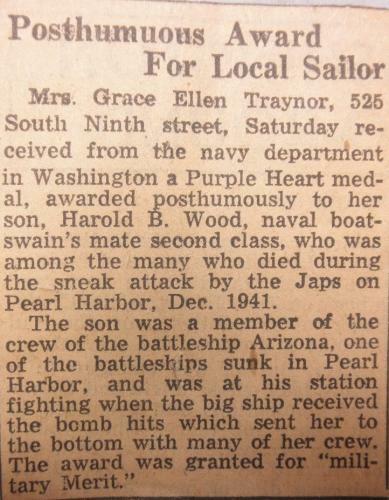 His next of kin on the 1940's paperwork is listed as Grace Ellen Traynor of Grand Junction, Colorado, who presumably was his mother. 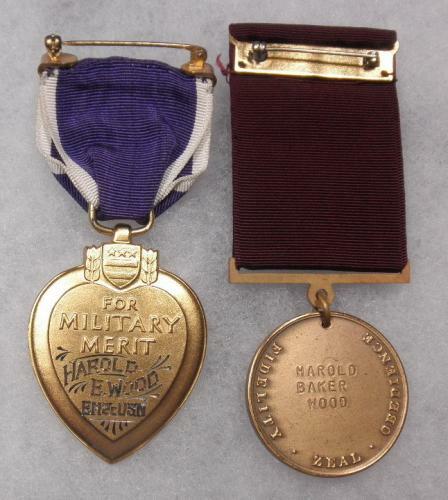 BM2c Wood's medal group includes his officially engraved Type 1 posthumous Purple Heart as made by the US Mint, officially named and undated pothumous Navy Good Conduct Medal, WW2 Victory Medal, American Defense Medal with Fleet Bar, Asiatic Pacific Campaign Medal, and American Campaign Medal. 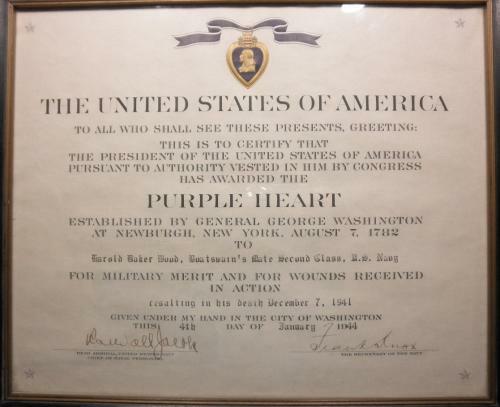 Also included in the group are the original telegrams sent home on December 20, 1941 stating that Wood was missing and the February 6, 1942 message stating that he was officially declared dead, plus his framed Purple Heart Certificate stating that he died December 7, 1941. 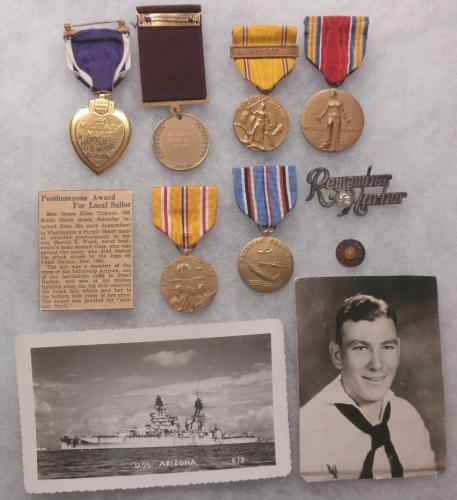 Other items include an original photo of Wood in uniform, two Pearl Harbor remembrance pins, a newspaper clipping from a Colorado newspaper describing his loss on the Arizona, information from NPRC in St. Louis that was obtained by the first non-family owner of the group, Gary Mohrlang of Grand Junction, Colorado; plus 8 inch by 11 inch glossy photos of the Arizona taken during and after the attack on December 7. 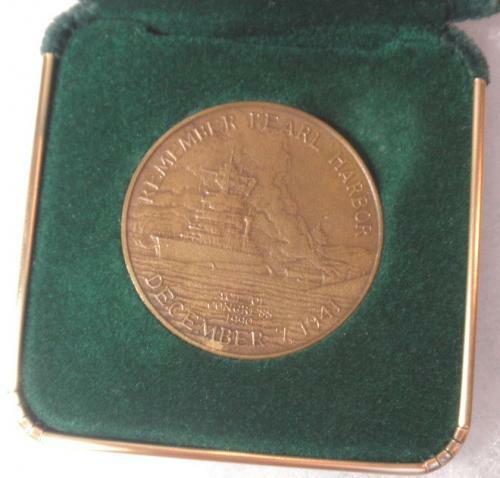 An original Pearl Harbor commemorative medal application dated 1993 and the medal are part of the group, as is original VA death claim paperwork.